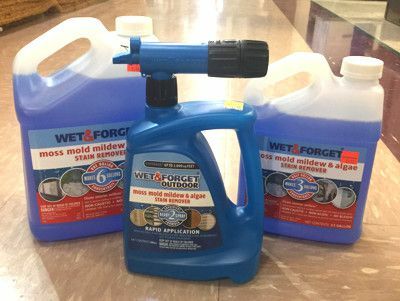 New to the Wet and Forget family of mold and mildew stain removers is their hose end applicator. This applicator makes it quick and easy to spray your home from ground level, including second story siding and roof surfaces. Simply attach your garden hose to the applicator and now you can spray up to 30 feet away! As their original Wet and Forget Outdoor product, the product is not intended for immediate results. Rather is slowly works to rinse away stains from mold and mildew without scrubbing! Apply once and it will help inhibit growth for up to 12 months as well. Lastly, Wet and Forget Outdoor is safe to use on almost any outdoor surface, including awnings, siding, brick, concrete, asphalt shingles, metal roofs, slate, flagstone, and so much more. With the new Wet and Forget hose end applicator, you can clean hard-to-reach areas in a pinch. You can treat an entire home, roof, driveway, or deck in just minutes!